This article deals with the chronology of the Hebrew Bible (or Christian Old Testament). For material on the Christian New Testament, see Chronology of Jesus, Historical reliability of the Acts of the Apostles, and Timeline of Christianity. For a historical look at the Bible see Historicity of the Bible. For the composition of the various books of the Bible, see Dating the Bible. The chronology of the Bible is an elaborate system of lifespans, "generations," and other means by which the passage of events is measured, beginning with Creation and extending through other significant events. A widespread scholarly understanding is that the Bible marks out a world cycle (Great Year) of 4,000 years, beginning with Creation and ending, presumably, around 164 BCE, with the year AM 2666 for the Exodus representing 26 2/3 of 100 years or two-thirds of the total. It was theological in intent, not historical in the modern sense, and functions as an implied prophecy whose key lies in the identification of the final event. The count begins with creation and Year AM 1. The passage of time from the Creation to the Exodus is measured by adding the ages of the Patriarchs at the birth of their firstborn sons, later through express statements, and later still by the synchronised reigns of the kings of Israel and Judah. The Exodus takes place in the year anno mundi 2666, or AM 2666, exactly two thirds of the way through the four thousand years, the Temple in Jerusalem is commenced 480 years, or 12 generations of 40 years each, after that, and 430 years pass between the building of the Temple and its destruction. The 50 years between the destruction of the Temple and the "Decree of Cyrus" and end of the Babylonian Exile, added to the 430 years for which the Temple stood, produces another symmetrical period of 480 years, and the 374 years between the re-dedication of the Temple by the Maccabees and the Edict of Cyrus completes the 4,000 years. As recently as the 17th-18th century, archbishop James Ussher and scholars of the stature of Isaac Newton believed that the date of Creation was knowable from the Bible. Today, the Genesis account of Creation has long since vanished from serious cosmology, the Patriarchs and Exodus are no longer included in most serious histories of ancient Israel, and it is almost universally accepted that Joshua and Judges have little historical value. Even the monarchy is questioned, and although scholars continue to advance proposals for reconciling the chronology of the Books of Kings, there is "little consensus on acceptable methods of dealing with conflicting data." A "Progenitor" chronology that placed Abraham's birth at AM 1600 and the foundation of the Temple at AM 2800. Alfred Jepsen proposed this chronology on the basis of melding time periods in the Samaritan and Masoretic recensions. Distinct chronologies can be inferred from the Priestly source (of the Pentateuch), along with priestly authors of later Biblical books, and the Deuteronomistic history, which purports to chronicle the reigns of the kings of Judah and Israel (with some significant historical corroboration, see below and History of ancient Israel and Judah). The Nehemiah chronology, devised to show 3,500 years from creation to Nehemiah's mission. Northcote says that this chronology was "probably composed by Levites in Jerusalem not long after Nehemiah's mission, perhaps sometime late in the fifth century BCE (i.e. nearing 400 BCE)." Bousset (1900) apparently sees this schematization, too, but calls it Proto-MT. A proto-Masoretic chronology, shaped by jubilees, with an overall literary showing of 3,480 years from creation to the completion of the Second Temple, per B.W. Bousset (1900), and which had the first Temple at 3,000 years. The Saros chronology that reflected 3,600 years leading up to the first Temple and 4,080 years from creation to the completion of the Second Temple. This scheme served as "the basis for the later LXX chronology and pre-SP Samaritan Pentateuch chronologies". The following table is derived from Thomas L. Thompson, The Mythic Past; notes within the table as cited. The Masoretic Text is the basis of modern Jewish and Christian bibles. While difficulties with Biblical texts make it impossible to reach sure conclusions, perhaps the most widely held hypothesis is that it embodies an overall scheme of 4,000 years (a "great year") taking the re-dedication of the Temple by the Maccabees in 164 BCE as its end-point. Two motives may have led to this: first, there was a common idea at the time of the Maccabees that human history followed the plan of a divine "week" of seven "days" each lasting a thousand years; and second, a 4,000 year history—even longer in the Septuagint version—would establish the antiquity of the Jews against their pagan neighbours. AM 1 Creation (Adam) From Creation to Abraham, time is calculated by adding the ages of the Patriarchs when their first child is born. It seems possible that the period of the Flood is not meant to be included in the count—for example, Shem, born 100 years before the Flood, "begot" his first son two years after it, which should make him 102, but Genesis 11:10–11 specifies that he is only 100, suggesting that time has been suspended. AM 1946 Birth of Abraham The period from the birth of Shem's son to Abraham's migration to Canaan is 365 years, mirroring Enoch's life-span of 365 years, the number of days in a year. There are 10 Patriarchs between Adam and the Flood and 10 between the Flood and Abraham—the Septuagint adds an extra ancestor so that the second group is 10 from the Flood to Terah. Noah and Terah each have three sons, of whom the first in each case is the most important. AM 2236 Entrance into Egypt The period between Abraham's call to enter Canaan (AM 2021) and Jacob's entry into Egypt is 215 years, calculated from the ages of Abraham, Isaac and Jacob; the period in Egypt is stated in Exodus 12:40 as 430 years, although the Septuagint and Samaritan texts both give only 430 years between Abraham and Moses, and Paul the Apostle of the New Testament agrees with them and against the Hebrew Bible. AM 2666 Exodus There is conflicting information on how long Israel is to spend in Egypt: Exodus 12:40 says 430 years, but Exodus 6:14–25 says this is made up of only four generations (Levi to Moses); similarly, Genesis 15:13 predicts the oppression will last 400 years, while Genesis 15:16 says Abraham's descendants will return in the fourth generation—the alternatives cannot be matched exactly, but the number 4 seems to play a central role in all of them. The Exodus (AM 2666) occurs exactly two-thirds of the way through the 4,000 years, marking it as the pivotal event of the chronology. It is also two-thirds of the way through the 40 notional "generations" of 100 years each, with Aaron, the first High Priest, being the 26th generation from Adam. AM 3146 Solomon's temple The period from the foundation of the Temple in Solomon's fourth year to its destruction is 430 years, found by adding the reigns of the kings of the United Kingdom and of Judah from the fourth year of Solomon. The fourth year of Solomon came exactly 1,200 years after the birth of Abraham (Abraham was born in AM 1946 if the two years of the Flood are excluded), and there were exactly 20 kings in both Judah and Israel following Solomon, despite Judah lasting more than a century longer than Israel. "It seems very likely that [some of the minor kings of Israel] have served simply to make up the numbers". AM 3576 Exile The period from the destruction of the Temple (AM 3576) to the "Decree of Cyrus" and the end of the Exile (AM 3626) is 50 years, which, added to the 430 years for which the Temple stood, produces another symmetrical period of 480 years. AM 3626 Edict of Cyrus Scholars have established that the exile lasted approximately fifty years, but the Book of Jeremiah puts it at 70 years, "clearly on ideological grounds" (the number 7 symbolises divine perfection, 10 symbolises fullness, and 7x10 gives 70 years). The Book of Ezra uses a 50-year time-frame when it places the commencement of the Second Temple in Cyrus's first year (538 BCE), in accordance with the jubilee law of Leviticus. 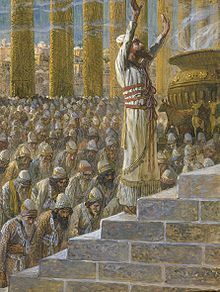 (164 BCE) Rededication of the Temple The final period is the 374 years between the Edict of Cyrus (538 BCE) and the re-dedication of the Temple by the Maccabees (164 BCE). The overall 4,000 year cycle is calculated backwards from this point. The canonical text of the Hebrew Bible is called the Masoretic Text, a text preserved by Jewish rabbis from early the 7th and 10th centuries CE. There are, however, two other major texts, the Septuagint and the Samaritan Pentateuch. The Septuagint is a Koine Greek translation of the original biblical Hebrew holy books. It is estimated that the first five books of the Septuagint, known as the Torah or Pentateuch, were translated in the mid-3rd century BCE and the remaining texts were translated in the 2nd century BCE. It mostly agrees with the Masoretic Text, but not in its chronology. The Samaritan text is the text preserved by the Samaritan community. This community dates from some time in the last few centuries BCE—just when is disputed—and, like the Septuagint, differs markedly from the Masoretic Text in its chronology. Modern scholars do not regard the Masoretic Text as superior to the other two—the Masoretic is sometimes clearly wrong, as when it says that Saul began to reign at two years of age and reigned for one year. More relevantly, all three texts have a clear purpose, which is not to record history so much as to bring the narrative to a point which represents the culmination of history. In the Samaritan Pentateuch, 'the genealogies and narratives were shaped to ensure a chronology of 3000 years from creation to the Israelite settlement of Canaan. Northcote reports this as the "Proto-SP chronology," as designated by John Skinner (1910), and he speculates that this chronology may have been extended to put the rebuilding of the Second Temple at an even AM 3900, after three 1,300-year phases. In the Septuagint version of the Pentateuch the Israelite chronology extends 4,777 years from creation to the finishing of the Second Temple, as witnessed in the Codex Alexandrinus manuscript. This calculation only emerges by supplementing Septuagint with the MT's chronology of kings. There were at least 3 variations of Septuagint chronology; Eusebius used one variation, now favored by Hughes and others. Northcote asserts that the Septuagint calendrical pattern was meant to demonstrate that there were 5,000 years from creation to a contemporaneous Ptolemaic Egypt, circa 300 BCE. The 2nd century BCE Book of Jubilees begins with the Creation and measures time in years, "weeks" of years (groups of seven years), and jubilees (sevens of sevens), so that the interval from Creation to the settlement of Canaan, for example, is exactly fifty jubilees (2450 years). Dating from the 2nd century CE, and still in common use among Jews, was the Seder Olam Rabbah ("Great Order of the World"), a work tracing the history of the world and the Jews from Creation to the 2nd century CE. It allows 410 years for the duration of the First Temple, 70 years from its destruction to the Second Temple, and 420 years for the duration of the Second Temple, making a total of 900 years for the two temples. This schematic approach to numbers accounts for its most remarkable feature, the fact that it shortens the entire Persian Empire from over two centuries to just 52 years, mirroring the 52 years it gives to the Babylonian exile. The early Church Father Eusebius (c. 260–340), attempting to place Christ in the chronology, put his birth in AM 5199, and this became the accepted date for the Western Church. As the year AM 6000 (800 CE) approached there was increasing fear that the end of the world was nigh, until the Venerable Bede made his own calculations and found that Christ's birth took place in AM 3592, allowing several more centuries to the end of time. Martin Luther (1483–1546) switched the point of focus from Christ's birth to the Apostolic Council of Acts 15, which he placed in the year AM 4000, believing this marked the moment when the Mosaic Law was abolished and the new age of grace began. This was widely accepted among European Protestants, but in the English-speaking world, Archbishop James Ussher (1581–1656) calculated a date of 4004 BCE for creation; he was not the first to reach this result, but his chronology was so detailed that his dates were incorporated into the margins of English Bibles for the next two hundred years. This popular 4,000 year theological timespan, which ends with the birth of Jesus, differs from the 4,000 timespan later proposed for the Masoretic text alone, which ends with the Temple rededication in 164 BCE. For detailed reconstructions of the chronology of the Hebrew kings, see Kings of Judah. The chronology of the monarchy, unlike that of earlier periods, can be checked against non-Biblical sources and seems to be correct in general terms. This raises the prospect that the Books of Kings, linking the Hebrew kings by accession and length of reign ("king X of Judah came to the throne in the nth year of king Y of Israel and ruled n years"), can be used to reconstruct a chronology for the monarchy, but the task has in fact proven intractably difficult. The problem is that the books contain numerous contradictions: to take just one example, since Rehoboam of Judah and Jeroboam of Israel began to rule at the same time (1 Kings 12), and since Ahaziah of Judah and Joram of Israel were killed at the same time (1 Kings 9:24, 27), the same amount of time should have elapsed in both kingdoms, but the count shows 95 years passing in Judah and 98 in Israel. In short, "[t]he data concerning the synchronisms appeared in hopeless contradiction with the data as to the lengths of reigns." Possibly the most widely followed attempt to reconcile the contradictions has been that proposed by Edwin R. Thiele in his The Mysterious Numbers of the Hebrew Kings (three editions between 1951 and 1983), but his work has been widely criticised for, among other things, introducing "innumerable" co-regencies, constructing a "complex system of calendars", and using "unique" patterns of calculation; as a result his following is largely among scholars "committed ... to a doctrine of scripture's absolute harmony" (the criticism is to be found in Brevard Childs' Introduction to the Old Testament as Scripture). The weaknesses in Thiele's work have led subsequent scholars to continue to propose chronologies, but, in the words of a recent commentary on Kings, there is "little consensus on acceptable methods of dealing with conflicting data." ^ Marshall D. Johnson (12 July 2002) . The Purpose of the Biblical Genealogies: With Special Reference to the Setting of the Genealogies of Jesus (2nd ed.). Wipf and Stock Publishers (1st ed, Cambridge University Press). pp. 32–. ISBN 978-1579102746. Perhaps the most widely accepted hypothesis regarding the chronology of the MT in its present condition is that the year AM 2666 for the exodus represents 26 2/3 generations of 100 year or two-thirds of a world cycle (Great Year) of 4,000 years. ^ Philip R. Davies (22 October 2015). The History of Ancient Israel: A Guide for the Perplexed. Bloomsbury Publishing. p. 43. ISBN 978-0567655837. More significantly, the Exodus occurs at a point (2666) that is two-thirds of 4,000. By adding the remaining 375 years we arrive—in our modern calculations—at 538 - 375 = 163 BCE, the date of the rededication of the temple by Judas Maccabee. Of course, this calculation implies that the framers of the chronology were aware of the accurate figure. So possibly the endpoint is the year of desecration (167), or even a date a little in the future, the date of the expected eschaton ... If so, the present Masoretic chronology dates from the second century BCE. ^ Joseph Blenkinsopp (7 November 2006). Opening the Sealed Book: Interpretations of the Book of Isaiah in Late Antiquity. Wm. B. Eerdmans Publishing. p. 87. ISBN 978-0802840219. Noteworthy, finally, is the hypothesis according to which the overall biblical chronology is based on a 4000-year cycle of Zoroastrian inspiration, a 'Great Year,' inserted into the biblical narrative calculating backwards from the same point in time, namely, the purification of the temple and the restoration of the temple cult in 164 BCE. ^ James Barr (1993). Bruce M. Metzger; Michael D. Coogan (eds.). The Oxford Companion to the Bible. New York: Oxford University Press. p. 118–119. ISBN 0195046455. If, as is possible, the Exodus took place in 2666 AM, is it perhaps significant that this is almost exactly two-thirds of 4000? ... If, as has been suggested, a figure of 4000 was held in mind, the present biblical chronology might be predicated upon the rededication of the Temple (about 164 BCE) after its profanation by Antiochus, which would establish a connection with Daniel, as well as with the books of Enoch and Jubilees. ^ Hughes 1990, p. 234. ^ Christensen 1990, p. 148. ^ Thompson 2007, pp. 73–74. ^ a b Barr 2001, pp. 96–97. ^ a b c d e Johnson 2002, p. 32. ^ a b c Thompson 2007, p. 74. ^ Barr 1987, p. 3. ^ a b Moore & Kelle 2011, pp. 81, 168. ^ Finkelstein & Mazar 2007, pp. 62, 74. ^ a b Konkel 2010, p. 673. ^ Northcote 2004, pp. 3ff..
^ On the "Priestly chronology", see especially Hughes, e.g., 233f. ^ a b Northcote 2004, p. 8. ^ Northcote 2004, p. 12. ^ Thompson 2007, p. 75. ^ Grabbe 2002, p. 246. ^ Barr 2001, pp. 98–99. ^ a b Barr 2001, p. 97. ^ Davies 2008, p. 28. ^ Davies 2008, p. 30. ^ Davies 2008, pp. 26–27. ^ Auld 2010, p. 20. ^ a b Lemche 2010, pp. 95–96. ^ Waltke 2011, p. 1188. ^ Davies 2008, pp. 24–25. ^ Blenkinsopp 2006, p. 87. ^ "Septuagint". Encyclopedia Britannica. June 15, 2017. Retrieved April 7, 2018. ^ Northcote 2004, pp. 14ff. ^ Hughes 1990, p. 245. ^ Milikowski 2011, p. 656. ^ Solomon 2006, p. 61. ^ Hughes 1990, p. 253. ^ Hughes 1990, p. 257. ^ a b Hughes 1990, pp. 259–260. ^ Hughes 1990, pp. 260–261. ^ Hughes 1990, pp. 261–262. ^ Tetley 2005, p. 2. ^ Galil 1996, p. 12. ^ Thiele 1983, p. 15. ^ Tetley 2005, p. 4 and fn.6. Auld, A. Graeme (2010). "Samuel, Sources, and Historiography". In Grabbe, Lester L. (ed.). Israel in Transition 2: From Late Bronze II to Iron IIA. Bloomsbury Publishing USA. ISBN 978-0567638403. Barr, James (2001). "Chronology". In Metzger, Bruce M.; Coogan, Michael David (eds.). The Oxford Guide to Ideas & Issues of the Bible. Oxford University Press. ISBN 978-0195149173. Barr, James (1987). "Biblical Chronology: Legend or Science?" (PDF). Ethel M. Wood lecture. Retrieved 1 February 2015. Blenkinsopp, Joseph (2006). Opening the Sealed Book: Interpretations of the Book of Isaiah in Late Antiquity. Eerdmans. ISBN 978-0802840219. Christensen, Duane L. (1990). "Chronology". In Mills,, Watson E.; Bullard, Roger Aubrey (eds.). Mercer Dictionary of the Bible. Mercer University Press. ISBN 978-0865543737. Finkelstein, Israel; Mazar, Amihay (2007). The Quest for the Historical Israel. Society of Biblical Literature. ISBN 978-1589832770. Galil, Gershom (1996). The Chronology of the Kings of Israel and Judah. Brill. ISBN 9004106111. Grabbe, Lester L. (2002). Judaic Religion in the Second Temple Period: Belief and Practice from the Exile to Yavneh. Routledge. ISBN 978-1134615629. Guillaume, Philippe (2007). "Tracing the Origin of the Sabbatical Calendar in the Priestly Narrative". In Zvi, Ehud Ben (ed.). Perspectives on Hebrew Scriptures (II, Volume 5). Gorgias Press. ISBN 978-1593336127. Hughes, Jeremy (1990). Secrets of the Times: Myth and History in Biblical Chronology. A&C Black. ISBN 978-0567629302. Johnson, Marshall D. (2002). The Purpose of the Biblical Genealogies. Wipf and Stock Publishers. ISBN 978-1579102746. Konkel, August H. (2010). 1 and 2 Kings. Zondervan. ISBN 978-0310865629. Larsson, Gerhard (1973). The Secret System. Brill. ISBN 9004036679. Lemche, Niels Peter (2010). The A to Z of Ancient Israel. Rowman & Littlefield. ISBN 978-0810875654. Matthews, K.A. (1996). Genesis 1–11. B&H Publishing Group. ISBN 978-0805401011. Milikowski, Chaim (2011). "Seder Olam". In Berlin, Adele (ed.). The Oxford Dictionary of the Jewish Religion. Oxford University Press. ISBN 978-0199730049. Moore, Megan Bishop; Kelle, Brad E. (2011). Biblical History and Israel's Past. Eerdmans. ISBN 978-0802862600. Najm, S.; Guillaume, Ph. (2007). "Jubilee Calendar Rescued from the Flood Narrative". In Zvi, Ehud Ben (ed.). Perspectives on Hebrew Scriptures II, Volume 5. Gorgias Press. ISBN 978-1593336127. Northcote, Jeremy (2004). "The schematic development of Old Testament Chronography: Towards an integrated model" (PDF). Journal for the Study of the Old Testament. Sage Publications. 29 (1): 3ff. Retrieved 1 February 2015. Ruiten, Jacques T. A. G. M. (2000). Primaeval History Interpreted: The Rewriting of Genesis 1-11 in the Book of Jubilees. BRILL. ISBN 9004116583. Solomon, Norman (2006). Historical Dictionary of Judaism. Scarecrow Press. ISBN 978-0810864986. Tetley, Christine (2005). The Reconstructed Chronology of the Divided Kingdom. Eisenbraun. ISBN 978-1575060729. Thiele, Edwin R. (1983). The Mysterious Numbers of the Hebrew Kings. Zondervan. ISBN 978-0825496882. Thompson, Thomas L. (2007). The Mythic Past: Biblical Archaeology and the Myth of Israel. Basic Books. ISBN 978-0465010523. Towner, Wayne Sibley (2001). Genesis. Westminster John Knox Press. ISBN 978-0664252564. Waltke, Bruce K. (2011). An Old Testament Theology. Zondervan. ISBN 978-0310863328. This page was last edited on 2 March 2019, at 22:40 (UTC).